A super-easy glaze is the final touch of flavour for the best-ever grilled chicken. Pour 2 Tbsp. dressing over chicken in shallow dish; turn chicken over to coat both sides of each breast. Refrigerate 15 min. Mix remaining 2 Tbsp. dressing, barbecue sauce and marmalade. Grill chicken 12 to 15 min. or until done (170°F), turning occasionally and brushing with sauce mixture the last few minutes. Serve with our Fantastic Grilled Corn on the Cob and hot cooked rice. 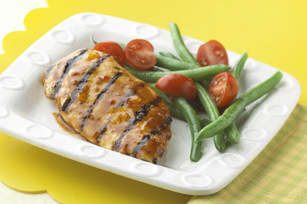 Chicken can be marinated in refrigerator up to 24 hours before grilling as directed.